Nothing. Yes, dear Reader, I got almost nothing for this post today. I have been fairly productive of late, but not with writing or blogging. Again, it’s the knitting. 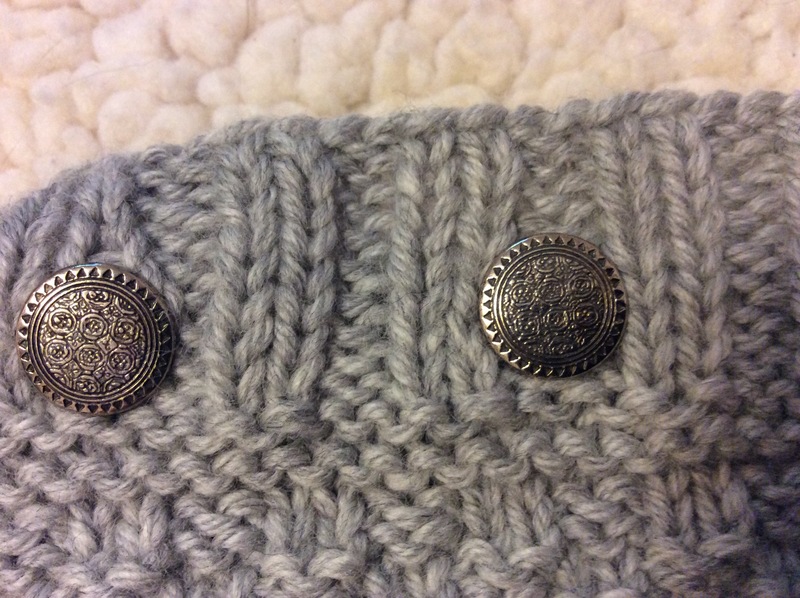 A friend noted that the buttons on the baby sweater I knitted for a baby-to-be might not be appropriate for a baby. Yes, they are cute cat heads but the ears are rather pointy, not too sharp against my rough old skin, but I don’t want to the buttons to be the cause of baby’s first injury. So I swap them out for these. And, to be honest, I think these buttons are better suited. They are pretty without drawing the eye entirely away from the sweater pattern. I hope to present the parents-to-be with the sweater and hat tonight. I’m sure they will be pleased that at least the outfit can be machine washed and dried, and yet it is wool. Merino wool, in fact, which is very soft. Well, that’s it for now. I’m thinking (again) of changing my blogging schedule. If I aim for Fridays, then I can have all week to write and revise my posts instead of doing them half-off as I am now. We’ll see. Oh, and what about the classes I’m taking? Well, the Modern Poetry class is a no-go for me. It’s too fragmented: too many links to follow, an audio here, a video there. Each week brings an email (or two) with several embedded links. In contrast, a class I started a long while ago (on a lark), through the same platform (Coursera) has a very simple syllabus, with all content accessible through my iPad app. The course is historical fiction and very interesting so far. I can (and have) happily watched a video lecture while knitting. I’ll say more about that class in a later post. I’m still looking forward (with eagerness and dread) to the Fiction Workshop that will be offered free through the International Writing Program. That will start on Thursday, September 24. And, no doubt, you’ll hear all about that as well. Until then a little eye candy for all you cat lovers: my green-eyed boy Junior. 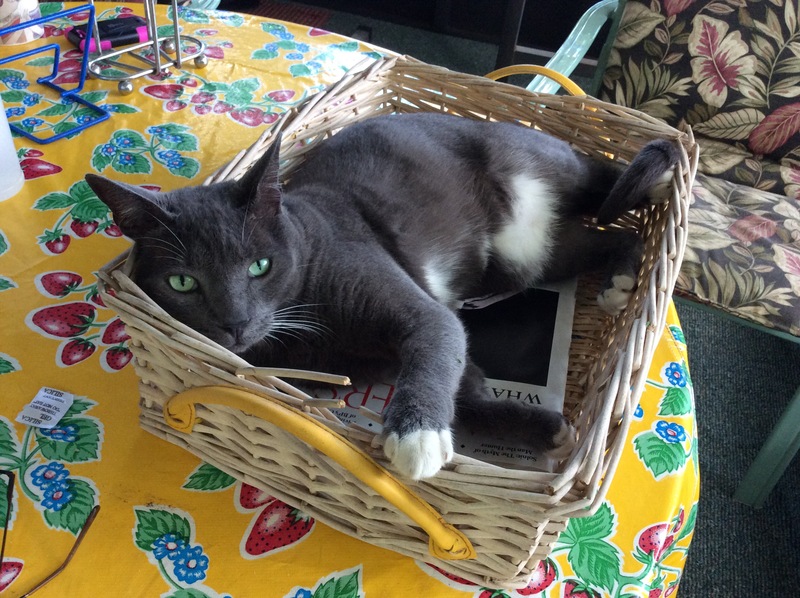 Why buy a fancy cat bed when an old basket and a couple of magazines make him happy? This entry was posted in Knitting, Procrastination, Writing and tagged baby sweater, Cats, fiction, historical fiction, knitting, procrastination, writing. Bookmark the permalink. Agree about the buttons. They look better with the color too from the small picture there. Sorry about the Modern Poetry class. Never fun when a class feels like a maze to get through. I loved the cat heads Marie!!!! I’m sure they’ll be delighted with the sweater. Merino wool—how nice! And I’m sure you’ll find another use for those cat buttons. They’re too cute not too. I’ve started blog posts with no idea about what I’m going to write. You did a great job. 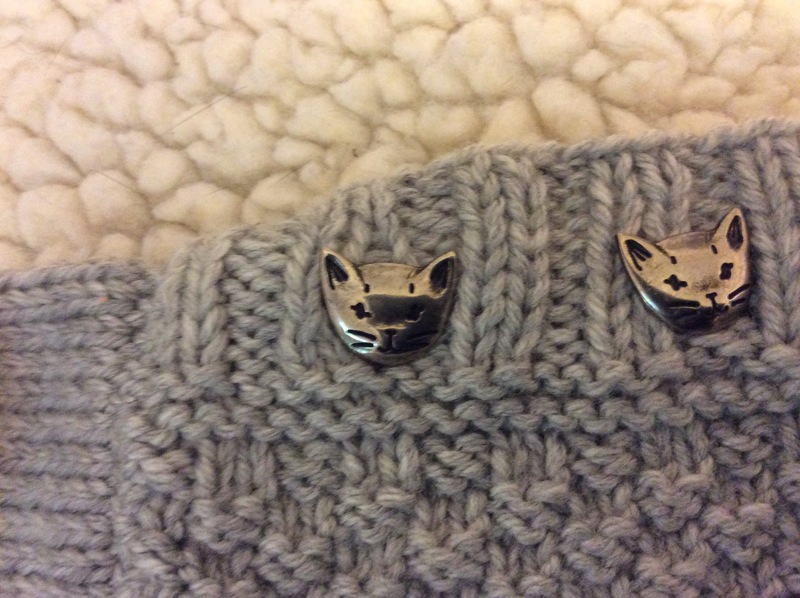 The sweater with the new buttons is adorable, as is your little boy cat. One of my boys is curled up in a basket as I write this. We have one in front of a window on an old desk. It has the added advantage of being over a vent, so that in the summer it gets a/c and in the winter heat. It’s kind of kitty paradise. Junior’s beautiful. I like the new buttons as well. I’m sure the parents will be thrilled. I agree that the new buttons seem more appropriate. What a gorgeous sweater. And Junior is gorgeous too with his come-hither stare. Love the picture of your cat. Seems like they are always laying in everything that remotely resembles a bed or a box. I did have a decorative woven straw bowl on my dining table, but the cat kept laying in it, so I hung it on the wall.